The Chicago Southland is the suburban region south and southwest of the City of Chicago, made up of approximately 70 municipalities. 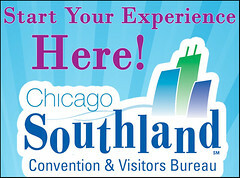 This region has been known as the Chicago Southland by the local populace and regional media for about 20 years. Bordered by Bedford Park (near Chicago Midway International Airport) on the north, the Chicago Southland extends south to Peotone, and more recently Kankakee. Its eastern boundary is the Illinois/Indiana State Line, and the region extends west to New Lenox, one of several rapidly growing Will County communities near Joliet. Known for its blue collar roots, the Chicago Southland was once home to the region’s steel mills and heavy industry. Some heavy industry still remains, but many Southland communities are transforming themselves into service-oriented economies as the bulk of heavy industry moves out of the Chicago metro region. Major residential development has made its way to the Southland as Chicago’s northern and western suburbs are filling in and developers search for the last available open land for subdivisions. Southland property values continue to soar, especially in the southwestern portion of the region. Nevertheless, housing remains affordable compared to the northern and western suburbs. In 2007, Forbes magazine rated three Southland municipalities as being the most “livable” suburbs in the Chicago Metropolitan area: South Holland, Park Forest, and Homewood. The November 17, 2009 issue of BusinessWeek named Tinley Park one of America’s Best Places to Raise Your Kids. Located at the nation’s crossroads, the Chicago Southland is served by interstates I-80, I-90, I-94, I-294, I-55, and I-57, and the six major U.S. rail lines. The Lincoln Highway – America’s first transcontinental paved roadway – crosses another famous highway, the Dixie Highway, in Chicago Heights, hence the city’s nickname, “The Crossroads of the Nation.” The Tri-State Tollway (I-80/I-294) which runs through this region has an oasis appropriately named the Chicago Southland – Lincoln Oasis near South Holland. The Chicago Southland is home to the First Midwest Bank Amphitheatre  (formerly the Tweeter Center), a large outdoor music theater; Balmoral Park Race Track  in Crete; and Toyota Park, new home of the Chicago Fire MLS Soccer Team.